Trogir, Dalmatia’s hidden gem is a remarkable small town with 2300 years of tradition, set on a small island on the Adriatic coast of Croatia in the center of Dalmatia. Hiding not so far away from Split, only 27 km, it is connected to the mainland and with another island, Ciovo with bridges. The historic city center is under the protection of UNESCO since 1997., recognized as a true example of urban continuity, an old town with a number of intact Renaissance and Baroque buildings and churches from the Venetian period. You can really get a sense of the Mediterranean while sight seeing and wandering the narrow streets of Trogir, sometimes nick-named the town-museum. Trogir is very well connected with the rest of the Europe through a good air network to Split’s airport. 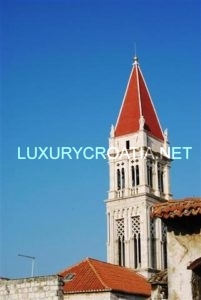 After you’ve reached Split, you can take a car or a bus, and you are in this beautiful old town within a few hours. You can also come with a boat, coming from the coastal cities of Italy, such as Ancona, Pescara, Bari or Venetia, and if you are coming to Trogir while cruising on your own boat, you will surely find a port for you to anchor in and enjoy, either the ACI Marina Trogir, Trogir Waterfront or on the island Ciovo waterfront. There is a lot to see in such a small place, so keep your eyes wide open while o bserving what Trogir has to offer, such as a well preserved castle and a tower, palaces and cathedrals from the 13th century. The most notable building may be the cathedral of St. Lawrence, with the portal of Radovan at the entrance to the cathedral being one of the most important and famous monument of the town. There is also a bell tower rising from the cathedral, making it the tallest building in this area. Don’t miss the castle of Kamerlengo either, a castle and fortress built by the Venetians in the mid 15th century that is sometimes used for performances in the summer season. 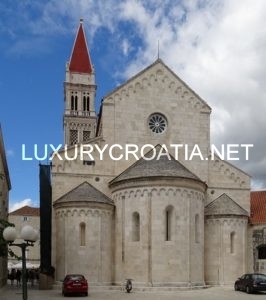 The Benedictine monastery, a thousand year old church of St. Nicholas in Is known for obtaining the oldest painting in Trogir, the “Madonna with Child” as well as the Kairos collection. 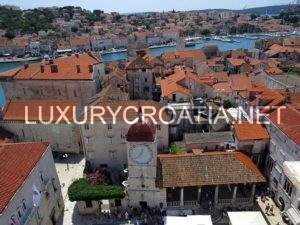 The rich heritage of Trogir is not the only thing to admire. The gastronomy here is similar to all Dalmatian cuisine, meaning that you will be able to enjoy plenty of healthy and light sea food specialties. If fish is not your favourite, you will still be able to experience the Dalmatia’s raw ham, prosciutto, sheep’s cheese, roasted lamb and locally grown vegetables drizzled with wonderful olive oil and rocky salt.